The picture below shows a magnified region of one of our current patient’s strip scar. After receiving multiple strip procedures from other doctors, he had been left with a very wide strip scar (4 cm thick) on the back of his head. Due to his much depleted scalp donor area, he elected to undergo body hair transplantation (BHT) into his existing strip scar. He responded particularly well to beard transplantation. Subsequent to this, Dr. Cole added chest hair to the scar. Dr. Cole pre-treated the scar with PRP prior to placing the grafts into the strip scar. Two weeks following his transplant to the strip scar, he returned to the office to have the scar re-injected with PRP and to have the strip scar micro-needled. Dr. Cole also injected the strip scar with ACell at this time. The patient returned again 3 weeks later for further evaluation and for one more treatment with PRP. The attached photo shows that, just 5 weeks after his procedure, the patient already has very good growth of chest hair in the strip scar. The very short hairs in this photo depict newly growing hair in the strip scar. Other points to consider include the following: Dr. Cole pre-treated the entire scalp with PRP prior to the procedure 5 weeks ago. Dr. Cole transplanted predominately body hair (from the chest, abdomen, and beard) to the scalp. Dr. Cole also treated the area with a small amount of scalp hair, though the amount of scalp hair was very limited due to the reduced donor supply. Dr. Cole placed abdominal hair in the CIT extraction sites on only one side of the scalp- a procedure he calls CIT farming. Dr. Cole pre-treated all of the CIT farming sites with PRP prior to placing grafts into the extraction sites. All areas, including the extraction sites on the scalp, were treated with PRP. Dr. Cole also treated the chest area, and parts of the abdominal area, extraction sites with PRP at the time of the procedure. 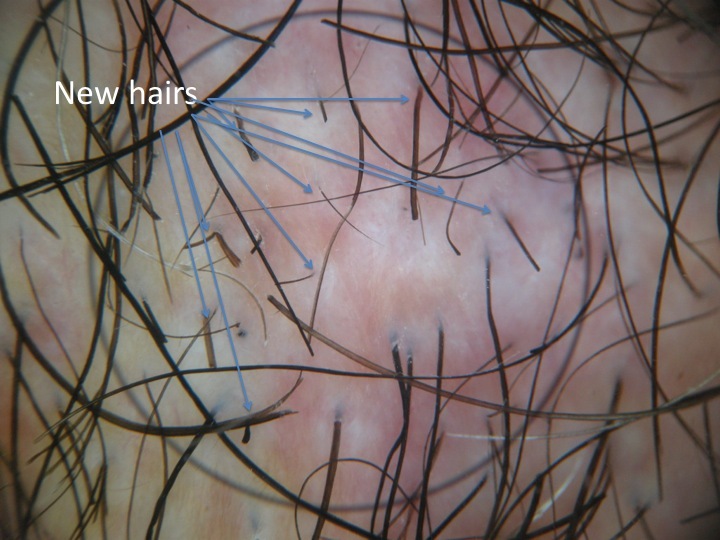 The patient had a very good overall response following his first procedure of body hair; the response, however, was most successful with beard hair. On his 5-week follow-up from his second procedure, the scalp areas that were pre-treated with PRP all showed some early growth, but no more than 10% of the grafted amount, and it was sparse. The donor area scar, however, exhibited a much higher yield. It is impossible to say at this point, but perhaps the injection of ACell two weeks after the transplant improved the yield in the donor area scar. The donor area sites treated with PRP and CIT farming also showed a much better response at 5 weeks. We will continue to follow this patient as we are very interested in the potential PRP has to improve the yield of body hair. BHT yield has been quite variable over the years. Some patients get very mediocre growth, while others seem to do much better. Perhaps the PRP will improve the results in those who did not fare as well from previous BHT procedures. We will also continue to monitor the results of our patient’s donor area scar that was injected with PRP and ACell. We can’t say for certain whether these impressive results are attributable to ACell, PRP, or some combination of both, but the unusual degree of growth seems promising. Today, we removed more beard hair and treated the extraction sites with both ACell and PRP. Dr. Cole also injected parts of the scalp recipient area, treated 5 weeks ago, with additional ACell. We will monitor the response of these treatments over time. One other interesting result occurred with the patient’s chest hair extraction sites: these areas were treated with PRP following BHT removal, and our patient reported that the sites healed in just 2 weeks. In his last procedure, the extraction sites took 2 months to heal. His abdominal extraction sites continue to heal, and are healing more slowly than his chest extraction sites healed. We did not treat all the abdominal extraction sites with PRP because his anesthesia wore off before we could treat the abdominal area fully. One additional note on PRP: A study completed by our Korean CIT licensee, in which patients agreed to have PRP applied only to one side of their head, showed that the PRP-recipient side showed faster hair growth than the control side. Again, we don’t want to jump to premature conclusions but the results of this side-by-side comparison are certainly compelling. Our clinic in Atlanta did not participate in this study. How about some better photos,before and afters,its as simple as that.I do not mean magnified photos so we cannot tell what we are looking at. I don’t get it. The image is magnified to a point where each hair is as thick as my USB cable. You magnify any part of my body with that, even a bald man’s head, and you’re bound to see some hair. What are we comparing the photos too? What did the PRP do? What did the ACell do? Guys, there are very few situations that make me stop and stare with regard to hair restoration surgery. This was one of them. This patient has a scar in his donor area that is wider than the width of your index and middle finger combined. 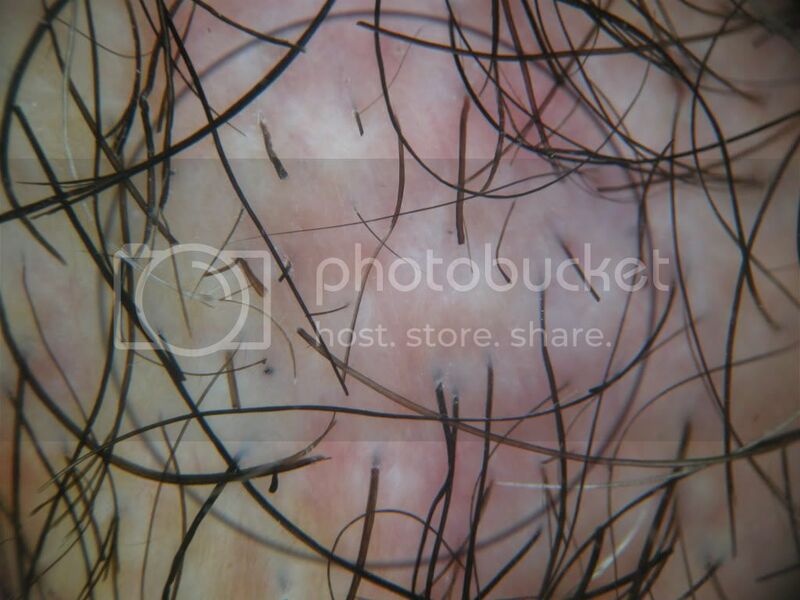 You are looking at the center of the scar one year after grafting with beard hair. The image is magnified for a reason. The long hairs are beard hairs grafted a year ago into this wide scar. The short hairs are new chest hairs grafted 5 weeks ago. I’ve tried to place arrows directed at the short hairs that depict new chest hair growth in the scar with is image. The surface area where the new growth is depicted is about 10 square millimeters. The growth in this scar 5 weeks after his procedure is really remarkable. I did not expect this. In fact, he had come back for a PRP treatment 5 weeks after his procedure. I noted some growth in the recipient area up top, but was not amazed. I lifted his hair in the scar area expecting the same result. To my amazement, the growth was far greater than I expected. I looked again and still I was impressed. Then I sat down, lifted the hair in the donor area and looked more closely. This is when I was completely shocked at the amount of early growth. I did not expect this. I have no idea whether the PRP and Acell injected 2 weeks after his procedure had anything to do with it, but the growth was far greater than I anticipated. The only place I injected the Acell was the donor area, yet this is where the growth was substantially ahead of its time. Did the Acell have anything to do with it? I don’t know. On the top I injected PRP twice, yet the growth at 5 weeks was simply ok. In the donor scar I injected PRP at the time of surgery along with micro needeling. Then 2 weeks later I injected Acell and PRP along with micro needling 2 weeks later in the scar. At the same time I injected PRP and micro needling on the top. The growth on the top was ok and consistent with 5 weeks post surgery. The growth in the scar was far more than expected. Body hair in general never ceases to amaze me in terms of results. Sometimes the results are not so good. Sometimes they are very good. Some sources do better than others in certain patients. Perhaps this is simply an isolated body hair result that is different in scar tissue than a balding scalp. Perhaps the Acell had an affect. Quite honestly, I expect Acell will improve the donor area healing. It might result in new hair growth in the donor area. It might not grow hair, but it should improve healing. I never expected that it would improve or accelerate hair growth in the recipient area by injecting it 2 weeks after surgery. Logically it should not accelerate hair growth. While PRP may do this and has been shown to do this in one study, Acell should not do this. Regardless, the result is really flooring in this case. It may not happen again so don’t get your hopes up too high. Never the less, this is a really remarkable early result. It is one of those don’t get too excited moments in hair restoration surgery, but keep your finger crossed, I hope we are stumbling on to something, but we may not. Perhaps the 2 week period is the time to inject Acell. Perhaps it is not. Time will tell. In the mean while it is proper to remain skeptical regarding the prospects of Acell. I had a fue procedure with Dr Bisanga recently and beard hair was placed near the crown. After 6 weeks all the beard hair seems to still be growing. I also had fue extracted from the chest area and there was no visible scarring after only 7 days. Keep in mind this was all without the use of Acell or PRP. I’m not knocking either protocol but I wouldn’t necessarily jump on that bandwagon yet. It could just be that the patient is a fast healer or something related to his physiology, but it is interesting to watch and see what develops. It’s also nice to see advancements being made in the field. Link to photos to see my own healing if interested. I live about 2 minutes from Dr. Cole’s office. Yesterday, I was at a business across the street from his office and remembered, I needed some Haircycle hair spray. I spoke with Dr. Cole briefly, and can tell you that he is intensely interested in the new technologies he is developing. These advances will serve to provide his patients with the best possible results. If doctors like Dr. Woods, Dr. Cole, Dr. Umar, etc. didn’t try new technologies, techniques and products, the art of hair restoration would not advance. I.M.O. we owe a great debt of gratitude beginning with Dr. Woods. Personally, I’m very thankful that Dr. Cole has been able to help me with the freakish result I got from the Bosley Medical Group back in the late 70’s.